Soak tamarind in 1/2 cup water & extract the pulp. Heat oil in a kadai.Splutter jeera and hing & saute methidana till brown. Add Besan and roast well till badami colour and aroma comes out. Add Haldi,Red chilli powder,vegetables and fry for 5 minutes. Then add water.After its 3/4th cooked,add tamarind extract and cook for another 5 minutes. Add salt ,jaggery and it becomes slightly thick and garnish with coriander leaves. Serve with rice and tuk. 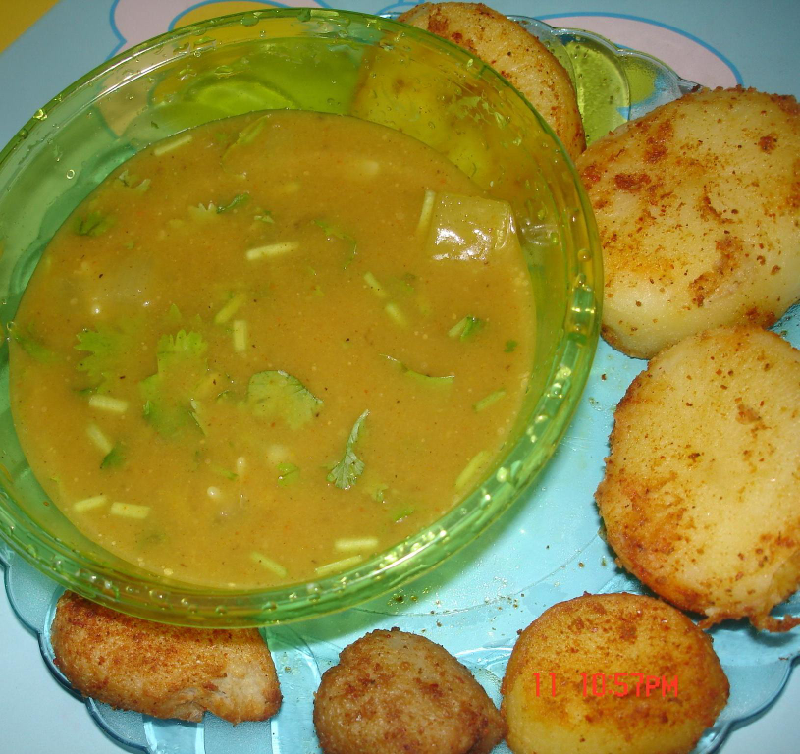 Boil potatoes and arvi in one whistle in pressure cooker. Peel the skin.Cut them of 1.5 inches round size and Keep in fridge for sometime. Slightly flatten the potato and arvi and fry them till golden brown. Sprinkle the powders. and salt.Tuk is ready. u can re-fry tuk if u want more crispy.